Some A#@HOLE IS SPAMMING MY SITE! CPA Elites - CPA Marketing Forum Open Discussions Elites Lounge Some A#@HOLE IS SPAMMING MY SITE! So some idiot is spamming the crap out of my site, I just blocked it all and thank god I did in time! Make sure it does not happen to you guys! 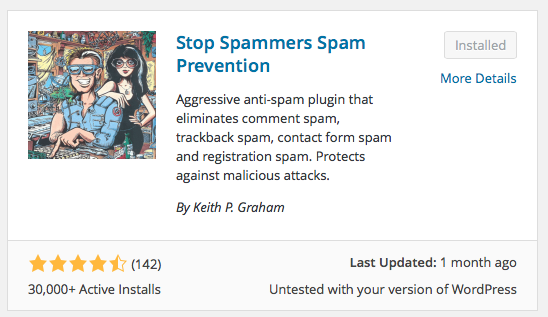 By the way I am using this plugin to stop the spam, super easy to use and VERY effective! (2016-05-14, 11:09 AM)SashaBlack Wrote: So some idiot is spamming the crap out of my site, I just blocked it all and thank god I did in time! Idiots will be idiots, right. Thanks for the headsup and the share too. I have to do just that on a daily basis to be honest lol! What kind of site? Multiniche blog with comments? (2016-05-15, 05:07 PM)Harrington Wrote: What kind of site? Multiniche blog with comments? fu#k spammers they can burn in hell lol! The A@!hole is still trying, thank god for that plugin I installed. Here are the new IPs he is spamming me from. So this is pretty bad, any suggestions as to what should I do? I mean I am protected but this can possibly overload my server? Any tips would be greatly appreciated, I have never encountered anything like this! Thank you. I would have a word with the hosting if I were you, it looks like who ever is doing this is being very persist (not a good sign). Whatever happens make sure you backup RIGHT NOW! install a plugin that auto backups your content/database, or if you used Softaculous go and tick the option because it will email you backups, daily. (2016-05-16, 12:10 AM)ϟ★ --- The previous Admin --- Eye★ϟ Wrote: I would have a word with the hosting if I were you, it looks like who ever is doing this is being very persist (not a good sign). Whatever happens make sure you backup RIGHT NOW! install a plugin that auto backups your content/database, or if you used Softaculous go and tick the option because it will email you backups, daily.